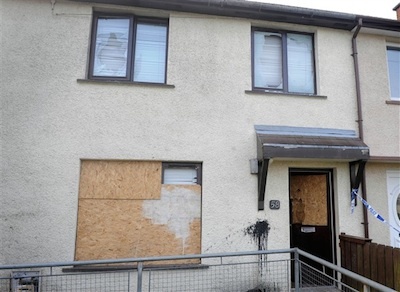 Between 100 and 200 armed loyalist paramilitaries ransacked houses and assaulted residents in Larne in a mob attack carried out with apparent impunity by the south Antrim UDA. Residents had no defence as a horde of thugs carrying hammers, clubs and cudgels descended on a residential area of the town on Sunday night, March 30th. Three were taken to hospital suffering hammer blows. The PSNI was accused of failing to prevent an attack which had been openly orchestrated in loyalist circles. Two charged on suspicion of causing criminal damage and assault on Thursday saw their prosecutions mysteriously abandoned by Friday morning. The mob gathered in the nearby town of Carrickfergus just before 8pm on Sunday before travelling to the Ferris Avenue and Knockdhu park areas of Larne and immediately began to attack property and cars. Two houses in the Ferris Avenue area were gutted. A family of five were inside one of the homes on Ferris Avenue when the windows were smashed. A 15-year-old girl in one of the houses was chased upstairs. A mother and her two sons also had their nearby home and car badly damaged. One mile away, at Knockdhu Park, a man was beaten on the head with hammers as he fought to keep the gang from entering his home, as a young child hid terrified from the mob. The UDA in Antrim have previously been responsible for the eviction of people from their homes, drug dealing and other criminality. Reports said the UDA mobilisation followed a row involving five men on Saturday afternoon. Two brothers were said to have been confronted by three men in the town and a scuffle ensued. The homes of both brothers were among those targeted and one of the two men was hospitalised. The local PSNI chief admitted members of the breakaway south-east Antrim faction of the UDA were behind the attacks, and said they were “on some sort of a power trip”. But his force were accused of taking a ‘softly, softly’ approach to the trouble while violence was being openly planned. The small number of PSNI slowly deployed to Ferris Park also caused anger. Sinn Fein assembly member Oliver McMullan said ‘opportunities were missed’ by the PSNI to intervene. He said he found it “hard to believe that over 100 men could gather in Carrickfergus and travel in convoy to carry out this attack unnoticed”. “Given the recent activities of the south Antrim UDA the level of under-preparedness by the PSNI is totally unacceptable,” he said. The failure of the unionist political leadership to condemn the violence was criticised by Sinn Fein. Party chairman Declan Kearney said it was a “disgrace” that figures from both the DUP and UUP still openly attend meetings, protests and public platforms with representatives of the UDA and UVF. His comments came as the DUP and Ulster Unionists were accused of adopting a “new tolerance” of loyalist paramilitary groups in a major report published this week by the Community Relations Council (CRC). “At present, any potential for a class-based, unionist political alternative emerging is being discredited and destroyed by the gangsterism and sectarianism of both the UDA and UVF and other unionist extremists,” Kearney said.